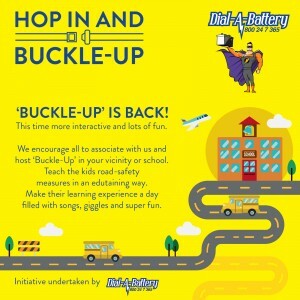 The popular on-site car battery replacement service, Dial-A-Battery, is back with its road safety campaign ‘Buckle Up’ in Abu Dhabi. Buckle-Up is a fun-edutaining initiative that teaches the kids the importance of buckling up their seat-belts in the vehicle. An initiative hosted by Dial-A-Battery that ensures every kid is safe while on the road. Buckle-up is a CSR initiative undertaken by Dial-A-Battery started in 2017. The main aim behind the ‘Buckle Up’ campaign is to educate the kids and ensure that road safety habits become a part of their routine from a very young age. Buckling up of seat belt is very important habit as it increases the chances of surviving a vehicle collision. The summer of UAE remains to bake everyone and probably everything, and we all would agree with that. But, we know how to keep up with the temperature unlike our cars. Have you ever been excited to head for something great, and then found your car battery is dead? Yes, I am talking about that cruel situation that heat brings in front of us at times. Yes, those morning howls of people has finally reached to the ears of Dial-a-battery, and it has brought up-to-the-minute onsite car battery services to your rescue. What is the #NeverGetStuck contest all about? #NeverGetStuck, this is what the company aims for and for which, it has brought an impeccable contest in collaboration with Radio Channel 4 (104.8 FM). The name of the show is 104.8 Channel 4 Breakfast with JJ & Nimi. Tune in to 104.8 Channel 4 Breakfast with JJ & Nimi on weekdays and win exciting rewards. The contest will have some easy questions, and the winners will be selected every day. Get Social and win AED 5000! Along with this, the company is also having a social media contest, which is a raffle draw and the winner will get a chance to win AED 5000. Enter the company’s Facebook contest for a chance to win this price money. This is certainly a great chance, and you should not miss it out! The great thing is that you can double your chances of winning by liking the company’s Facebook page and tagging a friend on the post. All you need to do is click on this link https://dial-a-battery.com/win-with-dial-a-battery/ and answer a simple question. 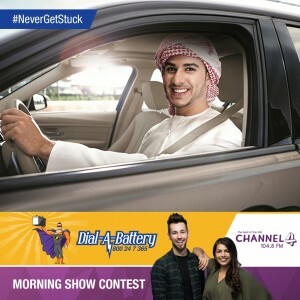 This campaign is basically to promote the idea of convenient and hassle-free service of Dial-A-Battery: Instead of wasting your time to take your car to the workshop / service center, you can get your dead car battery replaced using Dial-A-Battery on-site service. Dial-a-battery is the leading company providing mobile automotive battery diagnostic and replacement services throughout Dubai, Abu Dhabi and Sharjah. This means, if you find your car battery dead any time of the day, you can have a help coming in your way by simply calling on the toll-free number 800 – 24 – 7 – 365. Alongside, you can also call the company for tire change and fuel delivery services. Dial-a-battery wants you to never miss out precious and crucial moments of your life because of dead car battery. What makes this service extraordinary is that the company allows you to call them 24×7, whenever you feel the need of their services, as they love to bring help to their esteemed customers. Say goodbye to your car battery trouble as Dial-A-Battery will make sure you #NeverGetStuck with on-site car battery replacement, tire change and fuel delivery services! It’s no longer a hidden fact that severe and extreme weather conditions usually have negative effects on vehicles of all types. When cars are not properly maintained, it will surely result in one thing which is the breakdown of that particular car. During the summer in the UAE, the weather conditions could cause some serious damage to your car if proper care and attention are not given to that particular car. This is because weather conditions make temperatures to reach a very high Celsius degree. You must give your car adequate importance for it to withstand the summer weather in the UAE. Cars are not supposed to be exposed to very difficult and inconsistent weather conditions because it will surely reduce the lifespan of that car in no distant time. So, even if one wants to expose his or her car in such conditions, the person must ensure that the engine and everything related to it must be properly checked and put in place. The engine must be checked properly starting from the radiator to the engine oil. Also, the coolant must always be filled to the very high level adequately and at every time so that the engine will not overheat in any way. Another factor to be considered is for the person to always park his or her car in a very cool environment such as under a shade to prevent the interior of the car from heat. So, it is expected that the interior of the car will surely last well because of this gesture.